molo softseating loungers utilize a flexible honeycomb structure and magnetic end panels to fan open into round 2135mm (7') diameter fanning loungers. The geometry of the honeycomb structure allows for a modest amount of paper to take on surprisingly impressive strength. As sculptural abstract forms made from a single material, softseating can be used creatively and interchangeably as seating or low tables. black kraft paper softseating, made from 50% recycled content, is a dyed with bamboo charcoal ink to create a rich, deep black colour. The robust black paper is completely opaque, fade-resistant, fire-rated, and 100% recyclable. softseating is also available in a variety of other material and colour combinations - as the 2135mm (7') diameter softseating lounger, as well as fanning stools/benches in eight sizes. 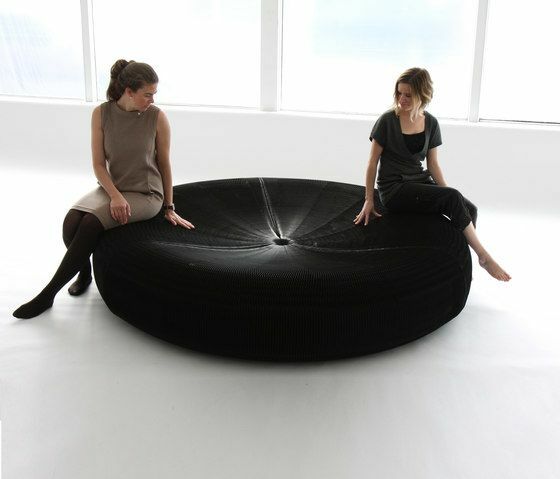 The flexible nature and large diameter of the fanning loungers allows them to be leaned on top of one another, or against walls to create uniquely contoured, organic shapes and backrests. The combinations of joining, stacking and leaning the fanning stools, benches and loungers allows endless possibilities for creating seating environments and interior landscapes. Each lounger element is created from three pieces that connect by magnetic end panels. If not in use, individual pieces can be compressed and stored, just like a large book on a shelf. Designed with the idea that aging is beautiful, textile softseating loungers are not intended to be disposable or thought of for short term use. In fact, the paper gets better with age, as the surface texture of the paper edges softens with use over time into a pleasing natural patina. As the loungers are used, the edges of the paper gently soften and crush, creating irregular facets that catch the light and form a unique organic pattern within the crisp honeycomb geometry of the structure. Although the surface of the paper softens, softseating maintains it’s structural integrity. softseating belongs to molo’s innovative and award winning soft collection of expandable/compressible furniture, lighting, and space partitions created from flexible paper and textile honeycomb structures.